SOLAR POWERED – High Quality & More Efficient Solar Panel 2V 70mA Solar Lights, 1.2 V 600mA Rechargeable AAA Battery Includes,Light Sensor Control Automatically On/Off – Charge under Sunshine on Daytime and lighting on Automatically at Night or Dark Environment,Charge 5-8h will Light Up 8-10h.Of Course,You Can Also Use Common AAA Battery as a Back-up if it’s not a Sunny Day. EASY OPERATE – The Mason Jar Lights Insert Silver Srew Lids with Built-in Fairy Star Firely Style LED String Lights (10 Warm White LED Lights Per String),Each light Insert with an On/Off Switch. Welcome Guide and Spared USB Battery Charger Include,?Mason Jars Not Include? OCCASION:Garden,Patio,Lawn,Christmas,Halloween,Pary,Wedding,Receptions,Formal Events&BBQ,Garden,Pathways,Ponds,Sun Rooms,Benches,Tables,Bookshelves or Window Sills Decoration Lighting. With the mason jar solar lights, you could make full use of your mason jars to DIY beautiful garden decor lights, deck decor lights and patio decor lights. 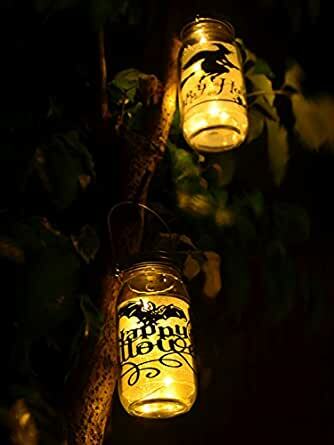 Or you can hang them on the tree, when you have a garden party or wedding night, these maosn jar night lights will definitely create beautiful and warm ambient beyond your expectation. You can also put them in your patio or along the pathway, they will provide enough accent lighting for you. You could decorate your house indoor or outdoor as well. Require no electricity, just sunlight to charge. Eco-friendly and easy to use. 6,This Mason Jar Light Lids are Waterproof Only When They’re Screw on the Jars,So Please Keep the Water Out of the Mason Jars.